Quilt borders maybe be created in an unlimited number of ways. However, I will keep this simple to start with and then leave you to come up with your own ideas for your quilt borders. My sampler quilts have a small (1/2" – 1”) inner border and then a larger outer one. I would suggest you cut your inner strips 1 ½” wide. Measure your quilt through the center vertically. If this measurement is (for example) 38”, then cut two strips of the inner one 38” long. Pin this to your quilt at each end, and in the center. Place a couple more pins in between. Sew this to your quilt, easing (making it fit) where necessary. If you have to ease, it is easiest to do by placing the largest part underneath,(i.e. big bottom – put the biggest part on the bottom) and gently stretching the top layer to fit. Now measure your quilt through the center horizontally (for example 40 ½”). This will be a different measurement than your vertical number because you have added inner borders. pin to the top and bottom of your quilt as suggested above. Ok, you are ready for your outer border. Decide how wide you want this to be. On a 9 block sampler quilt, I would make it anywhere from 3 ½” to 5” wide. Any larger and it will be out of proportion. Same with any smaller. If you can’t decide, then just cut your strips 5” wide. That’s a good size to begin with. Just like you added your inner border, you need to measure through the vertical center of your quilt and cut two borders that exact size. Pin and sew onto your quilt. cut the last two borders that size. Now your quilt borders are done and your top is finished. You are ready to layer, quilt, and bind it. There are numerous books on the market which give you some interesting and innovative ideas. They can be simple, like strips of fabrics sewn together or rows of small blocks, to intricately pieced ones. Sometimes (especially if I’m short of fabric!!!) I put blocks at the corners of my quilt as shown in this quilt. Finished with "Quilt Borders ? 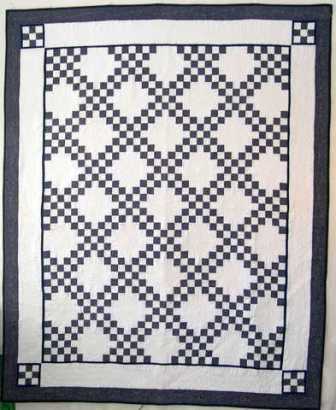 Go to "Lesson 4 - Backing" Or Return to "Learn to Quilt" Or Return "Quilting HomepageHome"